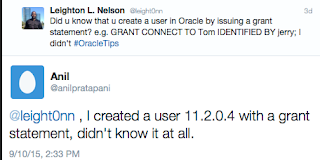 I was teaching an Oracle Database 12c New Features class recently when I stumbled upon something I found quite interesting. While preparing for the class, I had to correct some of the exercises that had been provided since there were some typos due to OCR conversion. For one of the exercise, I had to create a new user and while I was entering the commands, I realized that I typed a GRANT statement before issuing the CREATE user statement. This must've been a typo I thought, but proceeded anyway. To my surprise Oracle didn't throw any errors at me! Well I must have done something wrong so let's try this again. First let's connect to the database - in this example I'm using Oracle 12.1.0.1 but I've tested and confirmed it works in Oracle 11.2 as well and should also work in Oracle 10.2 but I haven't tested it. Now there is no Tom in my PDB so let's just grant the CONNECT privilege to the non-existent user. That seemed to work. Let's check if the user now exists. And he does! This was new to me and a few others since I tweeted my discovery and others had the same sentiment. This is also documented in the Database SQL Language reference. The IDENTIFIED BY clause is part of the grantee_system_privilege. This means that it doesn't work for object privilege grants. To illustrate I'll try to grant insert on the employees table to a non-existent user "TWEETY". 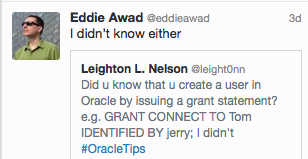 I don't recommend using the GRANT statement to create a user. I'd rather explicitly use the CREATE statement for that purpose. Has anyone used this before? Feel free to leave comments below.